I will never forget the first time I witnessed a distinct and very clear answer to prayer. I had just finished my junior year of high school and had been chosen to attend Governor’s School that summer. Governor’s School was an 8 week long program for gifted and talented high school students and was known for being a very liberal environment and not super faith friendly. I had grown up in a Christian home and accepted Christ as my personal Lord and Savior as a child, but had never experienced any type of persecution for my faith. Growing up in rural North Carolina was a safe place to be a Christian and I had honestly never had to defend my faith. So, to say I was nervous about leaving home for the summer and heading into what could possibly be an antagonistic atmosphere for faith was an understatement. For the first time I prayed differently than I ever had before. I prayed very specifically. I asked God to please just give me ONE FRIEND at Governor’s School who shared my faith. The day came to travel to the other end of the state for my summer experience. My mom was out of town, so my dad had to take me. He was in a time crunch to meet someone so we grabbed a quick bite to eat at a McDonald’s. I was chattering on nervously when I realized that my dad was being really quiet. When I looked up I saw tears in his eyes. Now, I had only seen my dad cry two other times in my whole life, so this was a little upsetting. I was already nervous!! After lunch my dad dropped me off in my dorm room at St. Andrew’s Presbyterian College. We had time for a quick hug and the next thing I knew he was gone and I was sitting on a bed that had yet to be made and a suitcase that had yet to be unpacked. I was in a suite with 11 other girls. Everyone else had their families with them helping them settle in, making their beds, hanging curtains, laughing and joking. And I just sat. For some reason, my roommate didn’t show, so not only was I lonely, I was also alone. I could hear other girls meeting their roommates and getting to know one another. I just sat there and prayed. Lord, remember that prayer that I’ve been praying for the past few weeks? Now would be a great time to answer!! It was time to walk across campus for the family orientation and one of the girls across the hall saw me sitting on my bed looking forlorn. She asked if I’d like to walk over to the orientation with her family. Her name was Karen and she didn’t know it but she was my new best friend. As we walked across the bridge, somehow our conversation turned to faith and I found out that this was the like-minded friend and my answer to prayer. I found out that she had prayed the same prayer. What a good, good Father to answer the prayer of these two young teenage girls within hours of arriving on campus. I could easily stop there and say – isn’t it awesome how God answered my prayer? But, in true God fashion, He went above and beyond – it turned out that 10 of the 12 girls in our suite were believers and another girl came to faith before leaving that summer. We were able to pray together, study the Bible together, and since we were all there for vocal performance, sing worship songs together with beautiful harmonies. It was an amazing experience and forever shaped how I felt about prayer. Throughout the years I have had many, many more answers to prayer, but nothing would keep me on my knees more than news of my son and his fiance finding out they were expecting mono-mono twins. After getting over the initial embarrassment of “Andrew, I taught you better than that”, I realized this journey would be a very tenuous one and would need to be saturated in prayer. You see, mono-mono twins are very rare (only 1% of twin pregnancies) and also very dangerous (50% don’t make it to viability) and 95% are born prematurely and spend time in the NICU. I have this horrible need to research things, which can be a very disconcerting way to be. The more I researched the more nervous I became and the more I realized how serious this was. The more I realized how vital prayer would be. 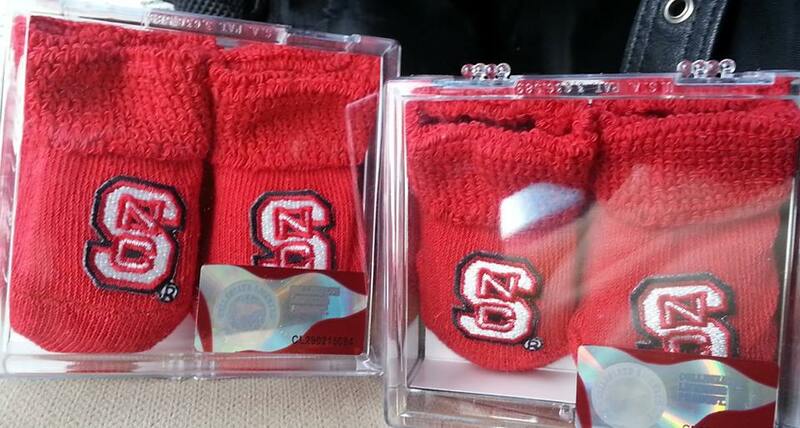 Since we are HUGE NC State fans, I went to Cracker Barrel and bought two pairs of NC State booties and placed them on my desk at work. They were my constant reminder to pray for my little grandbabies. Mary Kate was very good about giving us information to pray about. She was very inclusive in telling us what was going on at each appointment. 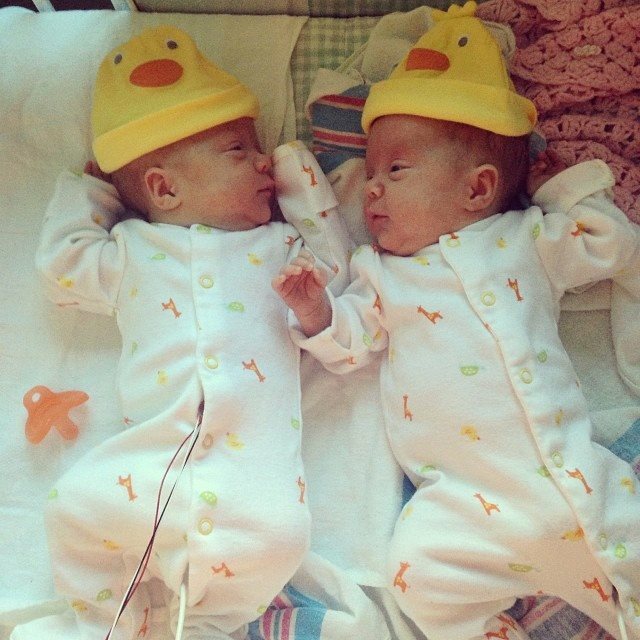 We rejoiced when we found out the girls were not conjoined (which is a risk with mono-mono twins). 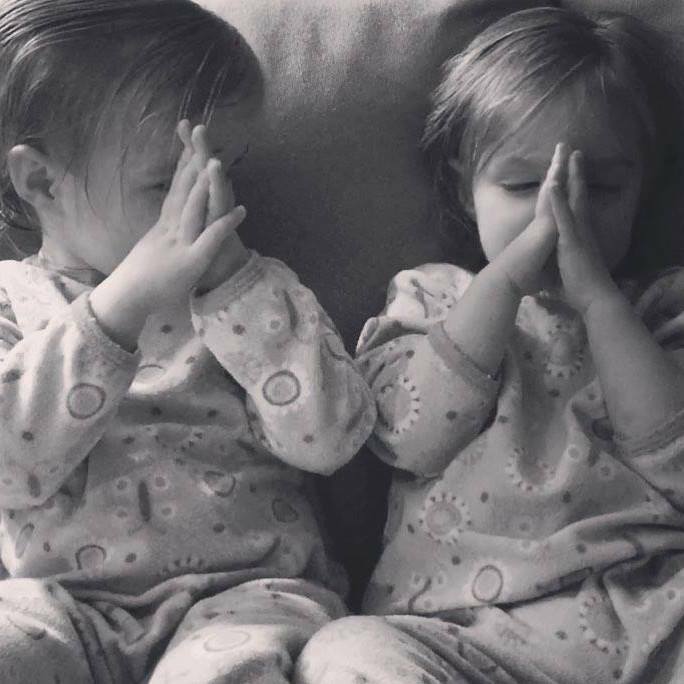 We prayed harder when we found out that one of the twins had a hole in her heart. We prayed every time the nurses came in to monitor the twins while Mary Kate was in the hospital (starting at 26 weeks). Her mom and I joined hands and prayed our hearts out when Mary Kate was whisked away for an emergency C-section on November 11. 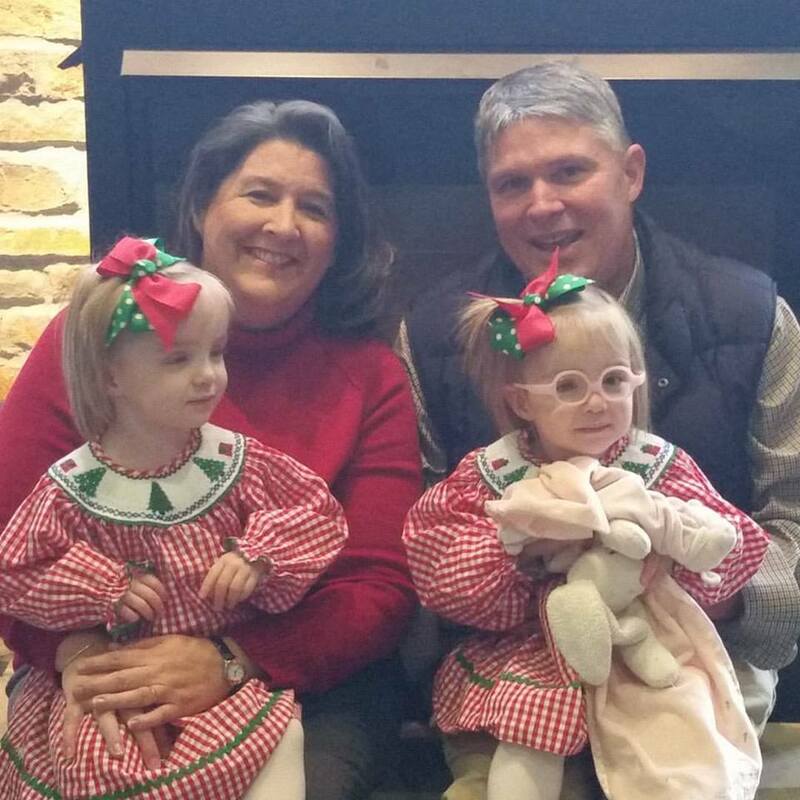 The next 24 hours was spent in constant prayer that these two little precious treasures would be ok. Every step of the way was bathed in prayer – from Amelia’s heart surgery, to every test that was performed, to bringing them home after 98 days in NICU. God so graciously answered all of our prayers beyond what we could ever imagine. We are blessed beyond measure. Every prayer strengthened my faith and encouraged me to pray even bolder prayers. Today I find myself in constant dialogue with God. I pray and ask for God to show me specifically how to handle a certain situation. I pray and ask God to show me who to ask to join our children’s team or who to ask to step into leadership. I pray and ask for ideas to reach children and families and help them grow in their faith. I pray for my family – that God would continue to lead and guide us to glorify Him. 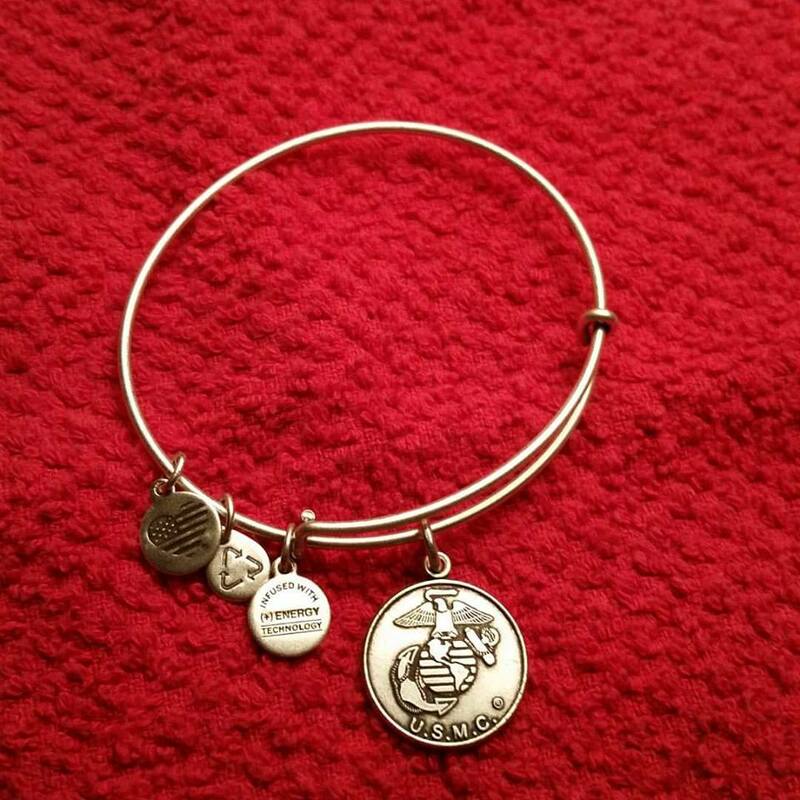 I wear a bracelet every day to remind me to pray for the safety of my Marine and the other military members and their families. I think about how excited I am to get an unexpected phone call from one of my boys, or, in Joel’s case, an unexpected conversation over dinner. If I get that excited about conversations with my children, I know God loves to hear from me, His child, as well. Do you see specific answers to prayer? If not, I urge you to start keeping track of your prayers and the answers. Sometimes the answer may not be what you expect, but I promise it is what you need. Answered prayer is faith building. Don’t sell yourself short on this wonderful opportunity to experience God. 3 Responses to Prayer time! What amazing, personal, and inspirational testimonies! God is so great and even when we don’t understand, he always has a plan! We may not understand at the time but Gods knows what he’s doing! (Isaiah 55:8-9) Thanks for sharing!